Weekends are free for the volunteers and you can go for short weekend trips. In Spain, you’ll see a magnitude of interesting sights. Visit the artistic Barcelona, the grandiose Royal Palace in Madrid, the imposing Catedral de la Almudena, the golden triangle of museums, Mezquita of Cordoba Ancient streets and many Renaissance, Baroque, Gothic and Romanesque monuments. Trust us, you will not get enough of the Spanish cities! You must also go to a football match which is a must when in Spain. While in Valencia itself there is a lot to do on the weekends or just relax on the beautiful beaches and get tanned! L’Albufera – If you love food and nature then the Albufera Natural Park will be like heaven for you. The best news is that it is just a ten-kilometer ride from the city. It is famous for having the largest lake in Spain that is separated from the sea by a thin coastline. You can take a boat trip onto this lake and enjoy the beautiful sunset. 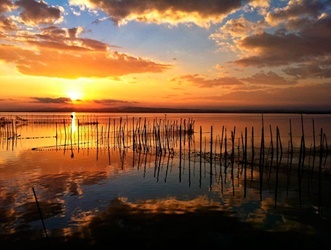 L’Albufera is also the home of the Valencian paella and is surrounded by a diverse wildlife. Sanguto – Sanguto is just 30 kilometers away from Valencia with its hilltop fortress and a history that stretches back approximately two thousand years. Its two main attractions are the Roman ruins and the Castle free and they both are free and involve a considerable amount of walking. You can easily reach Sanguto by car, bus or a train from Valencia. Xàtiva – Want to visit a full-blown castle? Well, Xátiva happens to be just famous for it and steep slopes! It is actually less than an hour of a car/train ride from Valencia having its own personality and heritage. Apart from the castle, don’t miss the black cave of the marvelous Jardin del Beso gardens. Try to visit this place in the cooler months to spare yourself this town’s scorching temperatures. 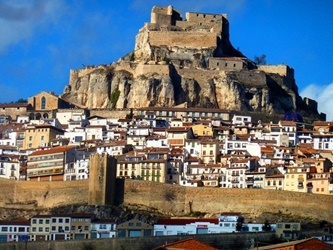 Morella – Crowned by a hilltop castle, this medieval town is located in Castellon to the north of Valencia. Morella is known for being one of Spain’s most beautiful towns. Near to it are the caves of María La Vella which is also a world heritage site, where you can explore some prehistoric paintings. You can drive here directly for two hours, or take an indirect train or bus connection till here from Valencia. Requena – Welcome to the center of cava and local wine! Drive through the countryside to get lost among vines or even stop for a quick tasting at the local wineries. Utiel Requena is this place’s local specialty and this red wine is made from Bobal grapes. And of course, don’t miss the town itself for its Fiesta de Vendimia in August because this is when they celebrate the end of their harvest and pray to God for plenty of rainfall next year. When should I apply for the volunteer programs in Spain? It is advised to apply for the projects once the volunteering/ traveling dates are decided as there are limited spots available. The application fee is valid for one full year and can be sent earlier than the desired year of volunteering for timely confirmation of the seat. As soon as you decide the travel dates, we suggest you apply for the program and hold your spot. We work on the basis of the first come first serve policy. Are there any necessary requirements to participate in the Spain Volunteer Programs? Intermediate level of Spanish for projects with children. Mandatory swimming knowledge for Marine Conservation Project. Yes, you are welcome to take part in Spain Volunteer Programs as part of a group. We welcome families, friends, high school students, college/university and corporate groups to volunteer together in the Spain Programs. I haven’t traveled or volunteered abroad before. Can I still be a part of VolSol Programs? 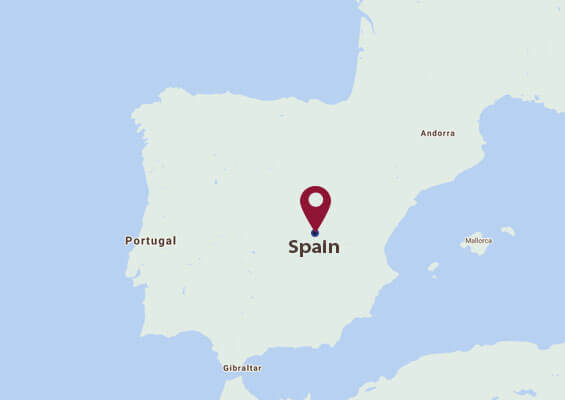 What are the Program Locations in Spain? 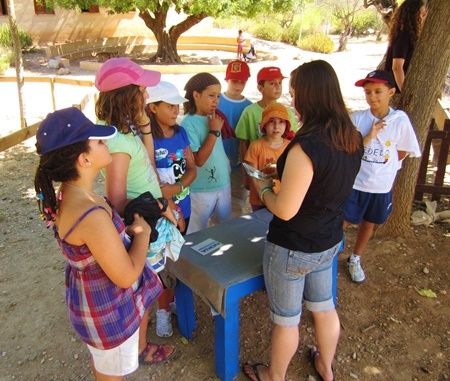 The Childcare programs are located in the quaint coastal city of Valencia. 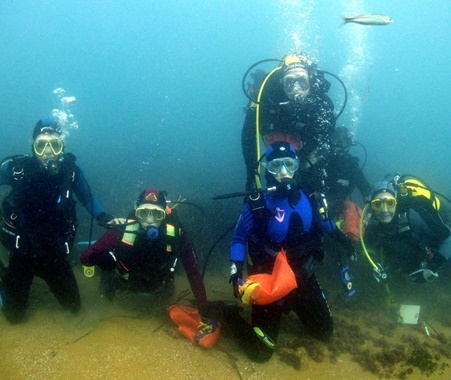 The Marine Conservation Project is located in the beautiful traditional town of Denia. Valencia has one of the most beautiful and sunny coasts of Spain, with several kilometers of beaches to enjoy the sea in a warm climate and practice water sports, and that’s why it is also an important tourist destination. Denia is at the heart of the Valencia Community, between the cities of Valencia and Alicante and less than 100 km from both international airports. Denia is very well communicated with other Spanish cities by bus and is also the closest city to Ibiza. It only takes a couple of hours to arrive at the amazing island by boat! When do I need to arrive in Spain for my program? What will happen once I arrive in Spain? There are two project locations in Spain - Valencia, and Denia. Volunteers joining the project in Valencia (Childcare and Conservation) are picked from Valencia Airport (VLC). Volunteers joining the Marine and Conservation Project in Denia, are picked up from the Alicante Airport (ALC). Volunteers are picked up from the airport by the local coordinator or representative and taken to the respective accommodations. Volunteers should arrive a day prior to the starting date of their chosen program. Volunteers usually work for 4 to 6 hours a day depending on their program. You will have weekends off, so you can travel on weekends. However, volunteers need to be flexible, open-minded and understand that work requirements can change as well on certain occasions. Participants (most nationalities) require a Tourist Visa to travel to Spain. Volunteering Solutions strongly recommends all volunteers to apply and get a Tourist Visa before departing for Spain. Consult the Spanish Embassy in your country for more details. If needed, Volunteering Solutions can provide with written documents that would help volunteers in getting the Visa. What are the recommended airlines to fly to Spain? Spain’s Airport is very well connected with the rest of the world and majority of the airlines fly to Spain. Some of the recommended airlines that fly to Valencia are - British Airways, Ryanair, KLM, Lufthansa, Aeroflot, Easyjet etc. All participants are recommended to consult their physician or travel doctor before traveling to Spain.To view the general list of vaccinations recommended for your travel to Spain, click here. How safe is Spain in general? Spain is one of the safest European countries to visit. Spain welcomes tourists and discerning travelers with open arms. To our volunteers, we recommend to go out and eat out after consulting their in-country coordinators. We also recommend that volunteers try to move out in a group and go for sightseeing together. You will be given safety precautions and instructions by the local coordinator team during the orientation as well as in your Pre-departure handbook after you become an enrolled participant. How can I connect with past Volunteering Solutions Spain alumni as well as other former and current volunteers? We encourage volunteers to get in touch with former Volunteering Solutions Spain program participants and also other program participants joining our projects. You are recommended to join the Volunteering Solutions Facebook Page or Facebook Group to communicate with other participants. Your program coordinator or a member of the local coordinating team will take you to your placement and introduce you to everyone after giving you a basic orientation about the program, its surroundings and other facilities around the location. Both the program destinations are modern cities and have multiple options to commute from the project to the placement.Most preferred modes of transport are buses, taxis, and metro. The projects are located in Valencia and Denia. Accommodation is provided from your start date to the end of the program. Accommodation will be according to the volunteer project you have selected. Projects which are located in the city usually offer accommodation in the city center in residences in a single room in a shared apartment. The accommodation is very comfortable with all the basic facilities. The rooms are well furnished and the apartment has a fully functional kitchen as well. Volunteers who wish to cook their own meals can do so. All the accommodation options are a great opportunity to interact with local and foreign people, learning about different cultures and making new friends from all around the world. Depending on your project placement, you will get evenings and the weekends free, to travel and explore the places.In the evenings, volunteers usually get together and go out for social gatherings. Weekends are free for the volunteers and you can go for short weekend trips. In Spain, you’ll see a magnitude of interesting sights. Visit the artistic Barcelona, the grandiose Royal Palace in Madrid, the imposing Catedral de la Almudena, the golden triangle of museums, Mezquita of Cordoba Ancient streets and many Renaissance, Baroque, Gothic or Romanesque monuments. Trust us, you will not get enough of the Spanish cities! Also, go for a football match which is a must when in Spain. Are there more expenses once I arrive in Spain? Your program fee does not cover your personal expenses. You will need to provide for yourself your personal expenses, such as bottled water, local transport, telephone, shopping, sightseeing etc. You also need to cover for meals, that aren’t included in the program. However, you should carry around Euros 75–80 per week for your basic personal expenses. This amount can vary and you would need a higher amount if you choose to go on weekend trips out of town.